Pope Francis arrived to celebrate Mass in Sibari, Italy. ROME — An old saying about the Vatican holds that the pope is never sick until he’s dead. It is a subject — pontiff’s health — on which Vatican officials come by their reputation for denial the old-fashioned way, because over the years they’ve certainly earned it. On Aug. 19, 1914, for instance, the semiofficial Vatican newspaper L’Osservatore Romano published a stinging editorial denouncing unnamed commentators who had suggested the day before that the reigning pope at the time, Pius X, was suffering from a cold. Less than 24 hours later, Pius X was dead. More recently, despite the fact that speculation began to surface in the mid-1990s that Pope John Paul II might be suffering from the symptoms of Parkinson’s disease, the Vatican never officially confirmed the ailment until shortly before the pontiff’s death. Even in John Paul’s twilight, the effort to make the pope seem stronger than he actually was continued. After he underwent a tracheotomy in late February 2005, a Vatican spokesman claimed the next day that the pope had eaten a light breakfast including 10 cookies, leaving embarrassed physicians to correct the record; a patient with a tracheal tube, they said, would not be in a position to swallow cookies. Needless to say, the media didn’t swallow the story either. All this brings us to this week’s alleged “health scare” regarding Pope Francis, after news broke that the pontiff has canceled his general audiences and morning Masses for the month of July. It came after Francis had taken a couple days off following his May 24-26 trip to the Holy Land, and shortly before the pope opted not to walk in a traditional Roman procession on Thursday as originally planned but rather to take a car to its conclusion. Vatican assurances that all is well fell on predictably deaf ears. If anything, many observers took the statements almost as confirmation that something must be amiss. In truth, sources close to the Argentine pontiff, and not just the usual Vatican suspects inclined to put a happy face on things, insist there is no health crisis. Yes, they say, Francis has put on some weight since his election. Yes, his back bothers him at times, making it uncomfortable to sit for long periods and explaining the occasional grimaces one sees on his face. Yes, he wears orthopedic shoes and sometimes walks with difficulty, and yes, he famously is missing part of one lung. On the whole, none of this is terribly out of the ordinary for a 77-year-old man, and none of it seems to be slowing Francis down. On the day news of the purported health scare broke, the Vatican released the schedule for an intense six-day trip Francis is planning to take to South Korea from Aug. 13 to 8. The Vatican has also confirmed that, as he did last year, Francis will not be taking the usual papal summer vacation in Castel Gandolfo in the cooler hills outside Rome, but will remain on the job in the Vatican. For the record, Francis also canceled his audiences and morning Masses during July last year, meaning there’s nothing exceptional about this week’s announcement. Instead, this seems to be his new rhythm — a reduced schedule in July rather than August. Those close to the pope say that if there’s a reason for concern, it’s not that anybody is hiding the truth about a secret illness but rather that Francis is simply wearing himself out. June 1 he traveled to Rome’s Olympic Stadium to spend almost three hours with 52,000 pumped-up charismatic Catholics. June 8 he staged an unprecedented prayer for peace with the Israeli and Palestinian presidents. June 15 he went down to the Roman neighborhood of Trastevere to spend two hours with 10,000 people from a Catholic movement called the Community of Sant’Egidio. Sunday he is expected to be at the desk catching up on work missed Saturday of a day trip to Cassano allo Ionio in the southern Italian region of Calabria, where he visited a center for palliative care, met with local clergy, lunched with the poor, dropped by a home for the elderly, paid homage to a priest recently killed in the area, and said Mass for a vast crowd. Whatever one makes of that activity, it’s nobody’s idea of restful Sunday afternoons. Still, if no reason for concern except about over-exertion, why the kerfuffle last week over the pope’s health? To be honest, it may say less about the physical condition of Francis than the psychological condition of the rest of the world. 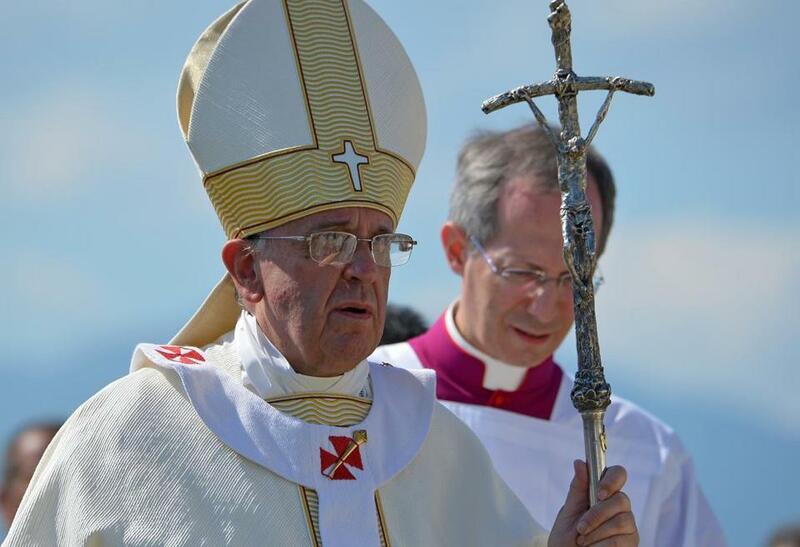 In 15 months, Francis has become something akin to the Catholic Church’s indispensable man. For many Catholics, their hopes for a more compassionate and open church are invested in Francis. For many non-Catholics, Francis has become like a new Nelson Mandela, a source of moral authority and an icon of personal integrity. One can argue whether those perceptions are accurate or deserved, but poll numbers and magazine covers alike say they’re real. As a result, people are likely to overreact to any perceived sign of weakness out of fear that this “Roman spring” may be short-lived. In other words, if this is how people react when the pope just needs a little down time, God help us when he’s really sick. Rocked by a series of humiliating financial scandals, the Vatican launches sweeping reforms intended to foster transparency and accountability. A maverick, non-Italian pope brings in a tough-as-nails, English-speaking cardinal to oversee the cleanup, a man with proven business savvy and a reputation for getting things done. If that sounds familiar, it should. Only the year is not 2014, the maverick pontiff isn’t Francis, and the finance czar isn’t Australian Cardinal George Pell. Instead it’s 1990, the pope is John Paul II, and the reformer is American Cardinal Edmund Szoka of Detroit. Now 86 and retired, Szoka was brought to Rome after the notorious Vatican bank scandals of the 1970s and 80s, when John Paul II pledged to make the Vatican a “house of glass.” Szoka had earlier presided over what was then the largest round of parish closings in American history – proof, many said, that he could make tough choices. While Szoka succeeded in ending 23 years of deficit spending, most observers say he didn’t really alter the Vatican’s financial culture, citing a series of scandals in the years since. Francis is now the latest pope to launch a much-ballyhooed financial overhaul, creating new oversight bodies and tapping the legendarily resolute Pell in February to lead the charge. But is there any reason to believe this effort will succeed where others have failed? One vote of confidence comes from Cardinal Daniel DiNardo of Galveston-Houston, the lone American tapped by Francis in March to serve on a new 15-member Council for the Economy. If there are grounds for optimism, they may not lie with Vatican assurances but from the fact that, post-9/11, the international financial system has been transformed and tightened; the pressures on the Vatican to conform to modern practices are greater than they have ever been. Juan Zarate, an American recently appointed to a supervisory council for the Vatican’s anti-money-laundering agency, was an antiterrorist financing expert during the Bush administration. In his 2013 book, “Treasury’s War,” he lays out how the US Treasury Department, in concert with like-minded allies, developed a new kind of financial warfare intended to choke off terrorist financing by compelling banks to stop moving dirty money. The idea was to raise the reputational risk and transaction costs for banks to such an astronomic level that no one in their right mind would turn a blind eye to where their clients got their money or what they were doing with it. As it turns out, the fallout from this push went far beyond making it harder for terrorists to hide money. Today, anyone who wants to engage the international financial system is compelled to play by the new rules of the game. For instance, if the Vatican wants commercial banks to process credit card payments at its museums, post office, and gift shops, then it’s compelled to obey global standards on due diligence. Otherwise it will face a repeat of what happened in January 2013, when Italy’s central bank froze those services. If it wants to transfer funds through correspondent banks, then it’s forced to provide an accurate paper trail, or it’ll face the same sanctions as in 2012 when JP Morgan closed a Vatican account. Vatican officials can talk until they’re blue in the face about their autonomy, sovereignty, and uniqueness, but none of that’s going to persuade Citibank or HSBC to look the other way if their financial interests are at risk. In that light, one can argue that this financial cleanup is the first reform in Catholic history driven not just by scandal or a new spiritual impulse, but by the aftershocks of a terrorist act. From the moment those planes hit the Twin Towers, the nod-and-a-wink style of handling money so common in the world, and long endemic to the Vatican, was doomed. If you long for a reason that things will be different, in other words, perhaps the most convincing is that this time the Vatican doesn’t really have a choice. The following are excerpts from the Globe’s June 18 interview with Cardinal Daniel DiNardo of Galveston-Houston, the lone American on a new policy-setting Council for the Economy. That body had its first meeting in early May, a session joined by Francis. Globe: A year from now, do you believe you’ll know how much money the Vatican has and how it’s being spent? Just a year? Come on now! I think it’ll take a little longer than that, but it won’t take an eternity. Beginning with the next fiscal year, I believe we’ll have much more clarity and consistency in how we do budgets. That’s half the problem in the Vatican — it’s not so much that things are awful, but they’re terribly inconsistent. One of the things we’re going to have to tackle over the next two years is something we’re facing in a lot of dioceses, which is the pension plan. This is going to require some deeper actuarial studies, so we have a clear answer as to how much has really been set aside. In terms of budgeting, we have to figure out how to distinguish operating expenses from capital improvements. We also need to get clarity about the Vatican’s real estate holdings — what are they, what are they truly worth, and what’s the best use of those properties? What are the obstacles to reform? The biggest one is what I call the “inertia of permanence,” meaning that this is a challenge to the way we’ve always done things. Some in the Roman Curia undoubtedly are nervous, not because they’ve necessarily got anything to hide, but simply because this is a completely new way of doing things. One example is internal controls on spending. In the past that’s been fairly lackadaisical, and it’s got to change. Are you worried about resistance from the Italian old guard? There may be some possibility of that. My basic sense is that [the reformers] are trying to walk a fine line, because they don’t want to just disregard the traditions of the Roman Curia. On the other hand, let’s face it, the bankers of Italy are superb but transparency isn’t always one of their virtues. In the past when financial questions came up in the Vatican, the answer was often to look at what the Italians were doing. Now the frame of reference is much more international best practices, and that’s a good thing. We’ve seen previous attempts at financial reform. Are you convinced that this will be different? That remains to be seen, but Pope Francis is certainly very intent on it. I think the real difference this time may be that Pope Francis also does follow-ups. I’ve heard from people who say that he may take part in a meeting about a project, and a week later you’ll get a phone call from him to find out where things stand. There’s always the possibility that the more things change, the more they’ll stay the same. That’s probably especially likely in the Holy See, because the Roman Curia is around 500 years old in its present form, and it’s tough to change a culture like that. However, if there’s one person capable of confronting them, it’s Pell. He’s not afraid to confront people. He doesn’t back down, he keeps moving. For one thing, we owe it to our faithful. I’ve talked to people back home about this stuff, and they all say “thank God they’re doing it.” This isn’t just about the Vatican, because it sets a standard for the church everywhere. [People will ask], ‘If the Vatican can get it right, why can’t my diocese?” Beyond that, maybe the Vatican can become a model not just for the Catholic Church but for everyone on transparency. On another financial front, the Vatican hosted a novel conference this week on “impact investing,” a relatively new concept that seeks to harness private equity rather than philanthropy to achieve humanitarian goals such as reducing poverty. The idea for the June 15-19 assembly came from Catholic Relief Services, the US bishops’ overseas relief agency, in tandem with the Mendoza College of Business at the University of Notre Dame. They partnered with the Pontifical Council for Justice and Peace under Cardinal Peter Turkson of Ghana. Carolyn Woo, president of CRS, believes that figuring out how to turn a profit from doing good may just be the future of Catholic charities. “The church has done so much with its social services. For more than 2,000 years, we’ve run education, health care, and so on,” she told the Globe June 17. Here’s an example of what “impact investing” looks like. Knowing that unsafe drinking water is a major cause of disease among the world’s poor, one way to tackle the problem is for charitable groups to solicit contributions and go around handing out bottles of water. The risk is that donations may run out, and in any event may never fully meet the need. Another way is to harness private investments in a firm such as Spring Health in India, established in 2010, which sells safe water at low cost to the country’s rural poor through private kiosks. The water is purified at the point of sale through a new chlorination process, and the company is already operating in 170 villages serving 85,000 customers, eyeing growth to 100 million and profitability within 10 years. On the conference’s opening day, Turkson promised that Vatican officials in attendance would be “good students,” and Woo says they were. One sign of interest, she said, is the organizers had originally planned to set aside three spots for Vatican personnel, only to be told they wanted fifteen. “This is high church meets high finance,” Woo said, insisting “it can’t just be capitalists on one side and social service people on the other” if the world’s lingering inequities are finally to be tackled. Woo said that many business types find impact investing attractive. She also said that the church can be a player in this new field not just as a recipient of investment dollars, but also with its own funds.